Revenge is a game full of many twists and turns. This motto is no more evident than in the film that has won director Hou Hsiao-Hsien the Best Director award at the 2015 Cannes Film Festival; “The Assassin”. This is Hsiao-Hsien’s first film in eight years, and over 500,000 feet of footage was shot for the film’s final 101 minute presentation cut. The film is set in ninth-century China, at the end of the Tang Dynasty, with popular Asian actress Shu Qi playing a highly trained female assassin who, after failing with one mission, is sent back to her home province to kill its governor (Chen Chang), who is also the man she loves. 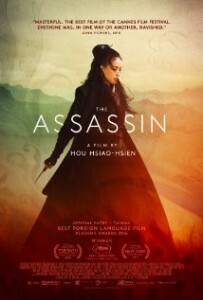 “The Assassin” is a visually stunning presentation in feminist defense. Yinniang (Shu Qi) is a female protagonist who is easy to get behind. She’s a badass with a sword, she commands respect, and she is absolutely fearless when it comes to her numbers of enemies. Yinniang faces the uphill battle of killing a man who was not only a former love, but a former employer. This structure in plot has been told before, but never in such a Chinese representation of the culture during a forgotten era. Hsiao-Hsien is a master behind the camera. He is someone with great respect for Chinese culture, and that comes off greatly with the wide angled camera shots. The characters come off almost as secondary when compared to the mass surroundings around them where anyone could be hiding. Couple this with patient and observatory storytelling, and the movie showcases that it cares more about the story and less about the consequences that are coming. This film is definitely for the story lover in all of us. Martial arts fans will yearn for more action but this is a film that exercises great restraint and rewards compassion, induldging those of a demanding nature will be rewarded when their dedication to the script pays off for the overall bigger picture. On top of this is a musical score that is very faint, as opposed to some Hollywood films where the score dominates the film. Hsiao-Hsien instead inserts it subtly, making the suspense peak at the right moment in every clip. The real wild card of this film however, is Qi. She is enigmatic in her responses, and a feel of alienation makes her a real firework to anyone who opposes her. What makes her character so enticing to me, was heart pounding revelation that she doesn’t need a gun from afar. She likes to do her killing close and personally, and that is something that kept me interested in her character. Qi is currently a megastar in Asia, and a role like this really set her apart from the roles she’s taken on in her past. To play someone so mysterious, yet enticing at all times, Qi was the best choice for a role so complex. She is beautiful in presenation, but deadly in execution. The rarest of messengers. “The Assassin” boasts itself as one of the most beautiful films to come to America in 2015. Behind a powerful message and crisp cinematography, It serves as an educational dose to the cultures and actions of a generation when the battle for respect was at it’s deadliest.The lives of many are in the hands and sword of one girl; “The Assassin”. You can find this tribute to film 101 at the best Independent theater in the land; The Nightlight, beginning on October 30th. If you haven’t been to The Nightlight, this is the perfect time to seek out the comforts and tastes of how movies are supposed to be experienced.